Kids will learn the 50 states and their capitals with this sturdy wipe-clean book meant to be used over again. In States and Capitals, the history of the United States motto "In God We Trust" is explored, as is the biblical principle of trusting in God. It's ideal for ages 7 and up. 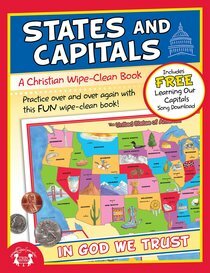 About "Wipe Clean Book: States and Capitals (Age 7+) (Usa Themes)"